Jackson Young is a singer/songwriter in a professional career spanning fifteen years. Jackson has formerly held two independent records deals (Platinum Planet, TMG), a publishing deal, and is currently calling Nashville, TN, home. “I’m blessed,” Jackson remarks. As a professional actor, Jackson has been featured as an extra, principal, and music video choreographer. He has experience in major motion picture, commercials, independent film, and television – some of which have been CMT and 20th Century Fox distribution, among others. In commercial, video, and currently independent film, he has been responsible for co-writing, casting, co-editing, producing, and executive production. Fortunate to have studied under a three-time world champion, Jackson has professionally trained in the style of Ballroom, Latin, and Swing, and has performed privately for groups numbering more than 100 people. Owning a private dance company, Jackson taught group and private lessons and choreography. While a professional instructor, his students won placement in Pro-Am dance competitions. Jackson has also been a featured principal dancer and choreographer for a national cruise line video. Most recently he is currently the cover model for a three book series, Diaries of a Casanova; Legend Awakening, Twisted Angel, and Rising Redemption which are co-written by New York Times and US Today Bestselling Author, Randi Alexander. We salute and support all our Armed Forces! The mission of Operation Troop Aid (OTA) is to provide care packages for U.S. Service members with the revenue generated through professional concert promotions and public financial generosity. OTA is a non-profit 501 (c) (3) corporation striving to make a positive difference and inspire our Armed Forces by letting them know Americans stand with them. There was not a dry eye in the room. 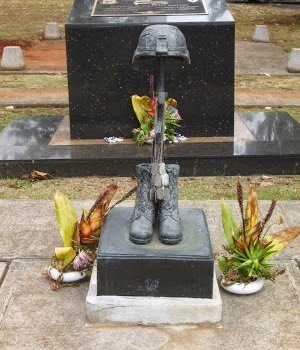 Mahalo, Jackson, for reminding us that Freedom is Not Free. 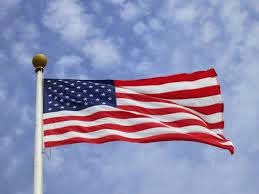 And for Memorial Day Weekend, I challenge readers to answer the call of the Rowdy Nation Flag Challenge at this link. Thank you for the info on Jackson and OTA. A wonderful post thank you. Rowdy is adorable. Powerful words. Thank you for posting it. WOW, all I can say is wow. Thank you for posting it. Thanks I am exploring the other sties. We have our own 'Buddy Bear', purchased when our youngest entered the army. The bear sits proudly beside an ancestor's Coffin Flag and medals. We must never forget those who have given the ultimate sacrifice. That was so amazing post to read. Wonderful post, Jackson. I was honored to be there to share such a touching morning. This event was the highlight of my trip to Dallas. Thank you for allowing me to be part of this. My "Made in the USA" US Flag is hanging outside and has been for days... I have a smaller garden-size which hangs year-round. I noticed Bed Bath and Beyond had a variety of "Made in the USA" flags if someone needs any--not pushing them, just giving as a source. Very powerful post and video. Thanks so much! I have my made in the USA flag hanging most of the time. Thanks for a wonderful and incredibly appropriate post. What a lovely tribute to honor Memorial Day. Amazing - thanks for sharing.